The roads escape me. Windyhill and Ae ring bells. It doesn't matter. The day was about a man and his car. The woods were simply the stage on which he performed that day. 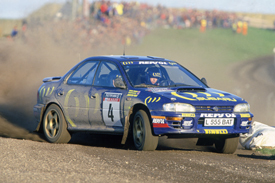 It was late summer in 1999 and Colin McRae had come home. And he'd come home in all his pomp, as the world's most expensive rally driver and star of Ford's television commercial. Most importantly, he'd brought his Ford Focus WRC with him. And he was taking it out to play the next day. Writing Motorsport News's report on the Colin McRae Forest Stages Rally that year, I was due to be waiting at the end of stages where I was supposed to loiter in the service area to talk to some of the best national drivers in the country. I didn't. I winged the report and went watching. Along with thousands of other fans, I raced from one stage to the next to watch McRae at work in his new motor. Never before had I seen so many spectators come and go before the first competing car had actually been down the road. We were only there for one thing: the course car. Just for a day, we were part of Colin's world. Quite unwittingly, McRae had an ability to motivate, entertain and mesmerise rally fans around the world. The chatter, the eager anticipation, the breath-bating suspense when you knew he was coming next was like no other. For a moment there was nothing else: just your brain trying to make sense of his speed. And, after he'd gone, exhilaration and elation had delivered on the expectation. He really was that good. And then he was gone. For good. My teenage years were totally tuned in to McRae. When he was on a round of the world championship, I would demand complete silence around every Radio 5 sports bulletin. And, on a post-event Wednesday and Thursday, during registration, break time and, surreptitiously, in double maths, the only words I was interested in were in MN and AUTOSPORT. And then I landed my dream job. And met my hero. And McRae was an absolute hero. And not just on the stages; before and after them as well. Wednesday, November 22, 1995. 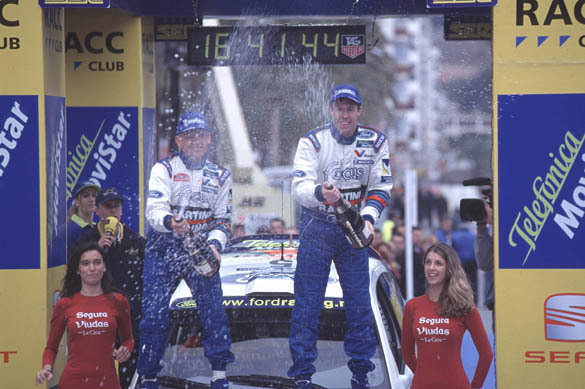 It was a big day for McRae and co-driver Derek Ringer. And it was a day that would begin and end in the pub. The end of the day was a predictable one for a couple of Scots who had just taken over the world. But the beginning was quite different. But very McRae. Embroiled in a titanic, ragged-edge battle with Subaru team-mate Carlos Sainz for that year's winner-takes-all RAC Rally, Colin found himself early at a time control in Corris, a mining village near Dyfi. With plenty of time before the 0738 start of the final day's first stage, McRae dived into the Slaters Arms and played some snooker. Cool as you like, he pocketed some reds. Gold would come later. Argentina, 1998, is a another special story. Leading the event, he thundered his Impreza WRC98 over a crest to find a rock in the middle of the road. The right-rear wheel took the impact and was smashed back into the arch. McRae barely lifted for the next two miles to the finish of the Giulio Cesare test. He and co-driver Nicky Grist whipped the wheel off to find a seriously bent suspension arm. With no spare and no option, the part was laid on one boulder and repeatedly smashed with another until it was straight. Or as straight as a couple of South American rocks could get it. This wasn't precision engineering, but it didn't matter. McRae put the spare wheel on and crabbed the car through the next stage. Fastest. Those are two of my favourite McRae moments. Recently, however, there have been plenty more memories revisited while writing and researching the Colin McRae bookazine, which finds its way on to the bookshelves of newsagents up and down the land this week. The theory of the bookazine was a simple one: to run the best period reporting of McRae's legendary career alongside some new stuff. David Williams, the world's finest rally journalist, the one and only true oracle of our sport who sadly died in 2005, provided the thrust of the thing, detailing McRae's early career and his success as the stakes grew ever higher. To complement the history stories, there are some contemporary words from me. Working on the bookazine was a genuine labour of love. It took longer, much longer, than it should have done; working from the heart rather than the head does that. And it was emotional, more emotional than I could ever have imagined. Five years down the road from that dark day when Colin, his son Johnny and two family friends perished in a helicopter accident and the hurt is still there. The mind-bending despair of the immediate moment might have faded, but the numbing heartache remains. We decided early on that we wanted to involve the McRae family as much as possible in the bookazine. To that end photographer Malcolm Griffiths and I headed north to Lanark to talk and to take some pictures. What would we talk about, what would Malcy take pictures of, we didn't know. There was no brief, no plan for that day. What we found was an incredible, inspirational group of people. As I sat around the kitchen table in Jerviswood and talked with Colin's wife Alison, daughter Hollie, parents Margaret and Jim and brother Stuart (and his other brother Alister on the telephone from his home in Australia), I had to catch my breath. It was a genuine honour and a privilege to share those moments and those memories. But, the biggest thank you and the most admiration goes to Miss Hollie McRae, Johnny's sister and Colin's and Alison's 13-year-old daughter. Hollie wrote the foreword in the bookazine and, as she read it aloud, time stood still. Articulate and eloquent way beyond her years, Hollie held us captivated in the same spellbinding way her dad managed. Hollie will never forget her brother Johnny. She cherishes the moments they shared. And she will never forget her dad, either. The world never really got to the chance to know Johnny McRae – something that would undoubtedly have changed once he got into a rally car – but we were fortunate to enough to count Colin among our friends. Remember him how you want. Remember him with his knee down on a superbike or hanging a Subaru in the Australian air, higher than anybody else over the Bunnings jumps. Or remember the sound and the sight, as he gathered a sliding Legacy at your corner; the locked wheels and clattering stones replaced by the thunderous bark of the boxer as the apex was attacked with a flash of flame from the side exhaust. Remember him how you want. David Evans is the rallies editor of AUTOSPORT. A successful rally driving father ensured an early introduction to motorsport and, fascinated as he was by rallying, the fourth estate was of equal interest. Having read (or at least looked at the pictures) from the age of two, he joined Motoring News in 1996 and later moved to AUTOSPORT in 2002.